“I had a dream but never dreamt of playing 100 international matches. 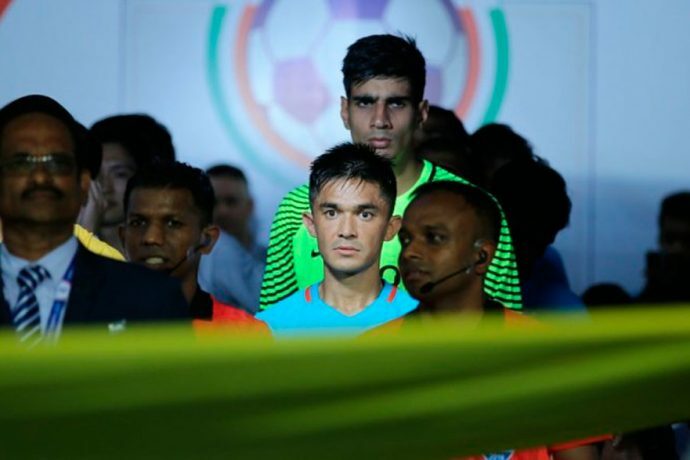 This is unbelievable,” national team captain Sunil Chhetri said prior to Team India’s practice session at the Mumbai Football Arena on Sunday (June 3, 2018). “Honestly, I never think much about milestones. It was only when I was having a chat with my mom the other night that she became a bit emotional. How big it was for her made me realise how big the occasion is,” he stated. Chhetri’s is the second Indian after his ‘mentor’ Baichung Bhutia to achieve the feat. “Once you grow older and you play more, you understand what’s not good for you rather than what works for u. As you grow older you tend to start filtering stuff which is not needed and which is not important for you. That’s what is learnt. So I do the things which work for me. It’s monotonous but I hope it continues,” he informed. “I still remember my first match for India. We were in Pakistan and Nabi-da (Syed Rahim Nabi) and I were the rookies. We were kind of chilling knowing that we may not be fielded. But Sukhi-sir (Sukhwinder Singh) made both of us to start the game. I scored a goal and all in euphoria I ran to the Pakistani fans and started to celebrate,” he smiled. There was laughter all around in the room. The captain admitted there has been a “steady growth” in Indian football since that first day he wore the national shirt. “We are on the right path. There has been a steady growth and we need to go far. Rubbing shoulders with the best will help us improve further,” he opined. “As a player, you are lucky if you get tougher games and the toughest one will be against Kenya tomorrow (June 4, 2018). The matches coming up the next day are always the toughest. The Asian Cup in UAE will also be very tough,” he maintained. “As a player, I have been in many a tough match. The games against South Korea, Australia and Bahrain in the 2011 Asian Cup were so tough. We played Japan in Bengaluru and that was tough too,” he recollected. Dubbed as the “true leader” of the team, Chhetri said he enjoys the competition against the youngsters in his quest to get fitter and better. “I feel good when I speak with Udanta (Singh) and sprint with him; I feel good when I try to get past Sandesh (Jhingan); I feel good when I try to score against the big wall (Gurpreet Singh Sandhu). All of them are true professionals,” he declared. “I always try to be a good example. I have understood that lectures don’t work. If I go up to Udanta and say to him about the importance of being on time, the importance of hitting the gym, maybe he will not take me seriously. Instead, I try to do it for myself so that the boys can follow. That’s so satisfying,” he nodded. “It gives me immense joy that Jeje (Lalpekhlua) who started in front of my eyes just the other day is now 2 short of 50 international matches. The effort to improve yourself is the hallmark of the squad,” he certified. Tickets for the match against Kenya are available online on www.bookmyshow.com and also at the box office counters at the venue. The match will also be telecast live on Star Sports 2, Star Sports HD 2, Jio TV and Hotstar.